This 8 night luxury safari offers guests the opportunity to visit Kafue National Park in Zambia, Hwange National Park in northern Zimbabwe, as well as, the mighty Victoria falls; one of the Seven Natural Wonders of the World. From one majesty to the next, guests will depart from the Kafue National Park and experience the Smoke that Thunders as they fly into Mosi-oa-Tunya National Park, to the luxurious Toka Leya Camp on the banks of the Zambezi river. Witnessing the pure strength of this tumbling mass of water is a powerful and humbling experience guests are sure never to forget. Finally, flying into neighbouring Zimbabwe's Hwange National Park where guests will camp in the best game-viewing area within the Park - the Linkwasha Concession. 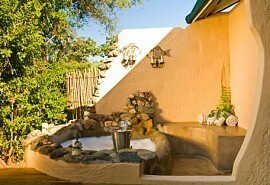 This ties together a trilogy of incredible wildlife viewing and an unmissable visit to the Victoria Falls. One day 1 guests will fly from Lusaka Airport in Zambia to the Busanga Plains in the north of Kafue, Zambia's largest National Park, where Shumba Camp is situated. The Plains, covering approximately 750 square kilometres, is considered one of Zambia's most important wetlands, as well as, a wildlife paradise with a wealth of plains game, predators and birds. 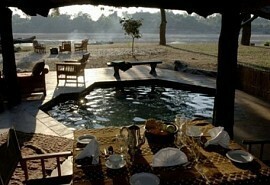 The Kafue National Park is one of the largest and most spectacular national parks in Africa and Shumba Camp is perfectly situated to afford its guests the opportunity to witness large numbers of plains game and their predatory counterparts; including some of the best lion and cheetah viewing in Africa. Shumba Camp comprises six spacious luxury safari tents, constructed in traditional Meru style, on raised platforms producing spectacular views of the surrounding plains. 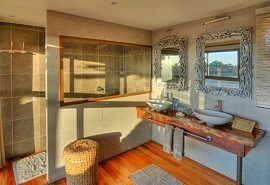 The large rooms have unique outdoor showers as part of their en suite bathrooms, giving guests an authentic African bush experience, but without compromising on luxury and privacy. 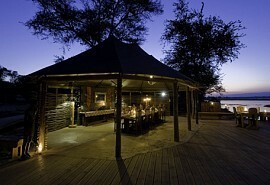 The dining and bar area is elevated, which will ensure that no sunrise or sunset goes unnoticed as many a delectable meal is enjoyed either here or in the cosy boma where guests can also enjoy elements of local Zambian culture. After enjoying a breakfast in the magnificent Kafue National Park guests will head for the much-anticipated Victoria Falls via light air transfer to Livingstone Airport. 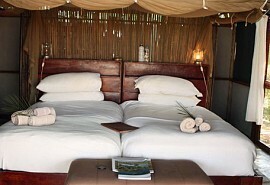 Toka Leya Camp is located in the Mosi-Oa-Tunya National Park ("The Smoke that Thunders") in an excellent location right beside the Zambezi River, about 6km upstream from the Victoria Falls. Toka Leya, where guests will spend the following 2 nights of their safari, has 12 spacious safari-style tents, all raised on wooden decks and have beautiful views over the Zambezi River. Each tent at Toka Leya Camp opens onto a large deck which leads, via wide glass sliding doors, to a stylish air-conditioned open-plan lounge area and bedroom.The camp's tents are beautifully decorated and very comfortable, while the lounge has warm, contemporary earth tones and African artefacts adding to this authentic ambience. Adding a bit extra, Toka Leya entertains with a picturesque infinity pool overlooking the Zambezi and also boasts a beautifully located spa right on the water's edge. From this prime spot, this leg of the safari affords a lucky look at the renowned Victoria Falls, as well as, allowing a game viewing experience in in the wildlife area of the Park. On the morning of day 6, guests will take a light air transfer from Victoria Falls Airport to Hwange National Park and to Davison's Camp, located near the border of Botswana and into the south-eastern part of Hwange. 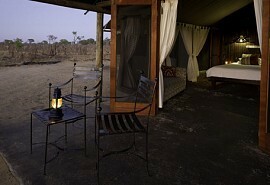 The last three nights of this splendid safari will be spent at Davison's Camp, within the dense, wild Linkwasha Concession. This area is reputed for hosting the most diverse mammal species in the world with over 100 species, and is undeniably the home of the highest population of elephants at approximately 30 000. Davison's Camp is a classic tented camp accommodating in nine twin-bedded chalets positioned under a peaceful grove of false Mopane trees, overlooking a waterhole and the open plains. Both the comfortable tents and the communal guest areas produce breathtaking views over the waterhole, allowing for effortless game watching and safari enjoyment. Game viewing is productive year-round in the Linkwasha Concession and wildlife frequently encountered here includes the Big Five, spotted hyaena, southern giraffe, sable, blue wildebeest, impala, common waterbuck and reedbuck.